China vs Uzbekistan FIFA World Cup Qualifier match is set to begin on 08 pm local time at Wuhan Sports Center Stadium in China. 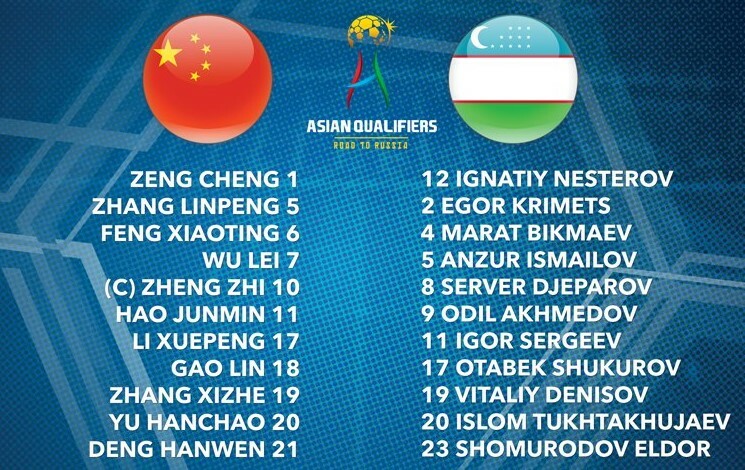 Uzbekistan can get into the World Cup directly if they earn some big points on today’s match against China. Currently, they spotted at the third position in the third round of World Cup Qualifier Asia (AFC) – Group A. They totally have four wins, four losses. While they didn’t register with any matches as draw so far in the round 3. But, China standing at the last position with six points by playing eight matches. They lost four matches against Korea Republic, Syria, Uzbekistan, and Iran. They also had three draws against to Iran, Qatar, and Syria in the qualifier round. According to the prediction, Uzbekistan having more chances to win the match today against China.